I’ve never read Mary Shelley’s original novel, and it’s been a while since I’ve seen either the classics with Boris Karloff or the Kenneth Brannagh-reimagening of the 90s. Thus, I can’t really compare this to the original text and/or the previous interpretations, but instead have to assess it on its own terms. And in that regard, it fares quite well. One thing that will probably irritate some viewers is the voice over-commentary by Adam (aka “Monster”), which gives voice to his inner feelings. For that, they went back to Mary Shelley’s novel, quoting directly from the book, and it might throw off some that he has all this elaborate thoughts, even though he can barely talk. However, since I gathered that these words were not meant literally, but rather expressed his inner feelings that he himself wasn’t capable of expressing to the outer world (or even to himself), it worked for me. I also liked that “Frankenstein” is told solely from the monster’s view. We never ever deviate from his perspective, and only see and hear what he sees and hears – thus pretty much putting the audience into his shoes. I also felt that they did a good job to convey his childlike mind, from which most tragedies of this story ultimately stemmed, and which lead to some beautiful, quite dramatic and haunting scenes. The cast was also great. Xavier Samuel does a very good job in a difficult role, Danny Huston was great as always, Tony Todd also plays a crucial role, and it was nice to see Carrie Ann-Moss again, who stood out as Adam’s surrogate mother. And I really enjoyed the quite clever and timely way in which they brought the Frankenstein-myth into our modern world. What you should be aware of, though, is that despite a couple of rather brutal scenes, this definitely is more drama than horror. After a strong beginning and until the then-again strong ending, the story’s lagging a little bit in the middle part. I’m also not sure if I like the fact that he accidentally meets the same cop over and over and over again – which felt a tad forced to me, and I just don’t think that their last encounter was really necessary. And as much as I love the ending in itself, the CGI-fire was pretty bad, and almost ruined that – otherwise – great shot for me (which was especially damning given its importance). 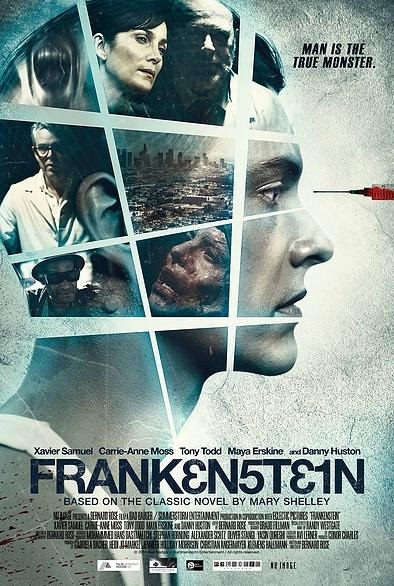 Ultimately, though, I really liked this modern interpretation of “Frankenstein” – which also managed to revive my interest for this particular story, which is why I will probably revisit the previous adaptations some time soon. This entry was posted in /slash, movie reviews, new releases and tagged /slash, /slash 2015, Bernard Rose, Carrie-Anne Moss, Danny Huston, Frankenstein, horror, Tony Todd, Xavier Samuel. Bookmark the permalink.